You can provide two different agent commission statements to your agents depending on how much information you want them to see. By default the agents can see their specific commission details on a transaction within their agent portal by clicking the Commission Detail tab within a transaction. 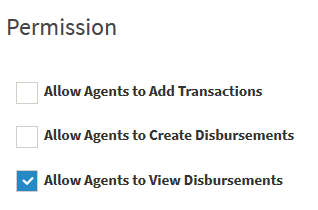 If you want them to have full access to the commission disbursement so they can see all the details of the deal, then you can go to Settings > Permissions and turn on the permissions Allow Agents to View Disbursements. This will allow the agent to view and download the full disbursement. Agent's also have access to the Pipeline Report allowing them to see their deal pipeline, and actual and projected commissions for their deals.